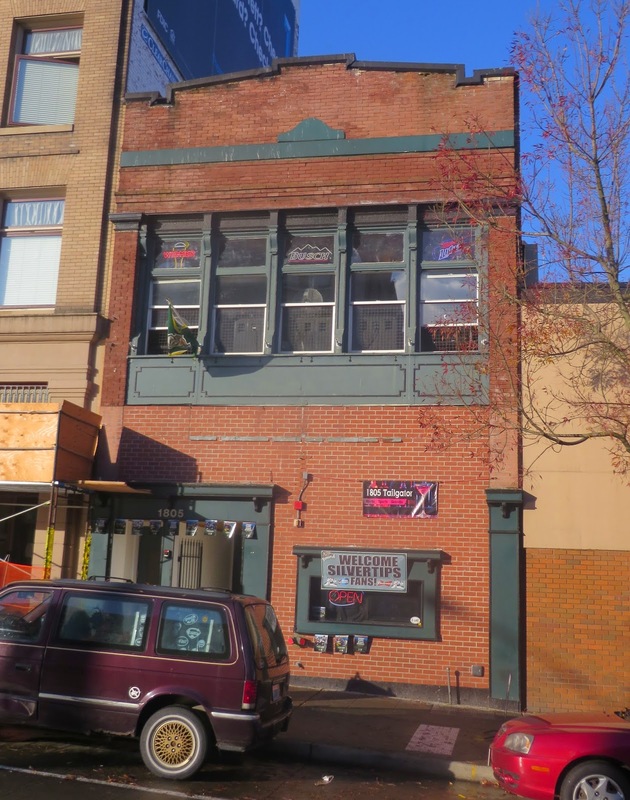 County tax records show the building currently hosting Tailgator was built in 1910, but there appear to have been bars at this address even further back from that, with the 1904 Polk directory featuring a bar owned by an E.E. Lynch here. By at least 1913 it was the "Horseshoe Bar," and in 1947 it is listed as the "Eagles Club Room," before returning as the "Horseshoe Tavern" by 1960. Known for a while as both "Tailgator Joe's" and "1805 Tailgator," the bar appears to have shortened its name to simply "Tailgator" in 2009. It is now a divey sort of sports bar, with cheap drinks and televisions downstairs, and a more dance club like floor above, which turns into Oakland Raiders central on NFL Sundays (Seahawks fans gather on the ground floor). It also hosts folks visiting nearby Xfinity Arena for concerts or Everett Silvertips junior hockey league games.